Casper Sleep designed The Essential mattress to be a streamlined version of The Casper, bringing it down to what is essentially…essential. It is simpler and firmer than The Casper mattress. A few of us may remember when the Volkswagen Beetle became popular, when Ford introduced the Pinto and the Maverick, when Chevrolet brought out the Luv pickup, and Ford the Courier. These were economy model vehicles, sharing the road with luxury models, such as the Buick Park Avenue, Lincoln Continental, and Ford Crown Victoria. Mattress manufacturers also have economy models. These are often called “entry-level” mattresses, the lowest-priced ones in their collections. However, the terms “economy model” and “entry-level” are relative – an entry level Aireloom mattress would be beyond reach for most of us. 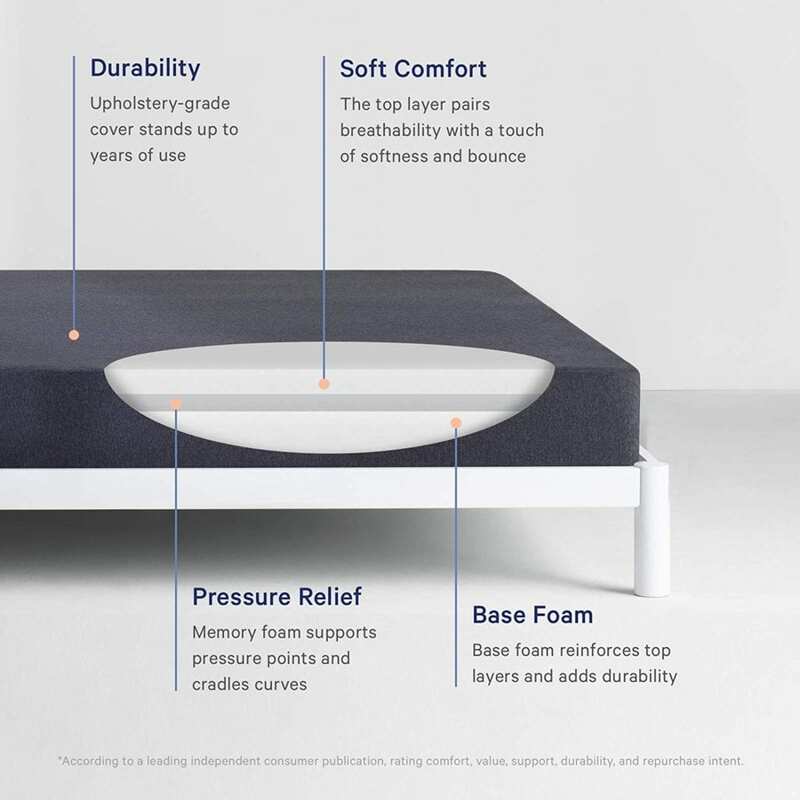 In 2014, Casper Sleep shook up the mattress marketplace with their Casper Mattress. This new mattress company had one model, and sold it only online, directly and through Amazon. They shipped it to buyers’ front doors and passed the savings on to the consumer. This way they were not adding the costs of retailing through brick-and-mortar stores. Along with a few other startups, this ignited the current bed-in-a-box movement. These new offerings were mostly memory foam mattresses. They came along a couple of years before the 25th anniversary of this kind of bed. The design of this mattress with a medium firm feel was directed at the middle majority of shoppers. Then in 2017, Casper Sleep expanded their product line with one up and one down. First came their luxury mattress, The Wave; then in October came their economy model, The Essential Mattress. Casper Sleep already had what was considered an “economy model” mattress. It was under-pricing traditional in-store mattresses, especially those by Tempur-Pedic, the original memory foam mattress company. From a handful of online-only, direct-delivery boxed mattresses, the field grew to hundreds, including several made by established manufacturers. The field also includes several cheap boxed memory foam mattresses, mostly made in China. According to Seth Porges, a contributor to Forbes, the market for these may have been targeted by Casper to provide more affordable mattresses made in the USA. The Essential is a three-layer mattress, 8.5″ high, contrasting with the current 10″ four-layer version of The Casper. 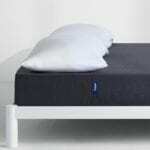 To make it more affordable, it has a simpler cover, less costly top foam, and half the thickness of memory foam. The cover of the Essential is a polyester hybrid knit. Like the outer cover of The Casper, this can be removed for cleaning. Being knit, it does not need other fibers (such as spandex) to be stretchy. Being thin, it lets the user feel the foam. The “hybrid knit” pattern could be to make it more breathable, but there isn’t more said along this line. The top “Soft Comfort” layer is 2” of high-resiliency polyfoam (polyurethane). The description does not claim that it is a latex-like foam. It is described as sinking in but quickly responding. The middle “Pressure Relief” layer of The Essential is memory foam, as are the second layer of The Casper and the third layer of The Wave. Here it is only 1” high. This alone cuts into the cost of the mattress, since quality memory foam is more expensive than regular polyfoam. This is the support core of The Essential. It is 5½” of high-density polyurethane base foam, the same as in the flagship model, The Casper. What The Essential does not have is the transition layer. At this time, The Essential is available only on Casper’s website, in select Target Stores, and on Target’s website. The availability at Target, a break from the online-only pattern, is an exclusive arrangement for now. The ones in stock at Target locations are already boxed, as are those for shipment. Customers can order a mattress online and pick it up at a store. Or it can be shipped. The customer can also go to that store to see and try the Essential before making the purchase. In essence, this is like Casper having hundreds of showrooms with counter-top ordering stations. 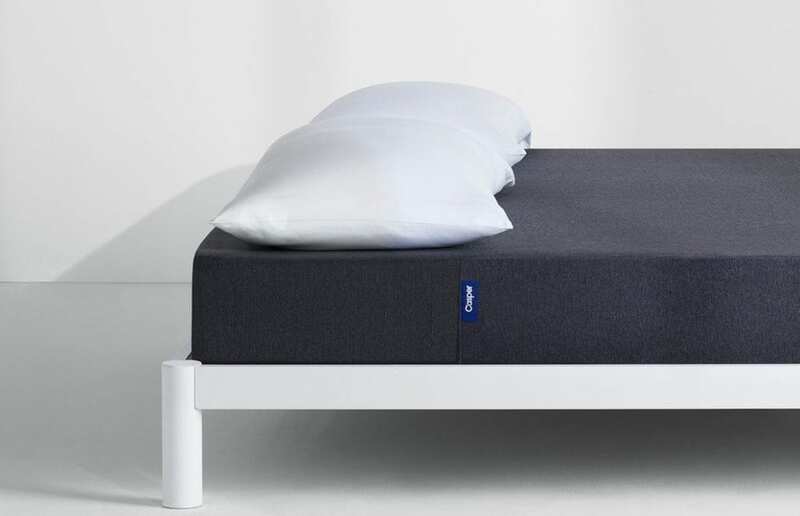 As with the other Casper Sleep mattress models, The Essential has a 100 Night Trial and a 10-year warranty. 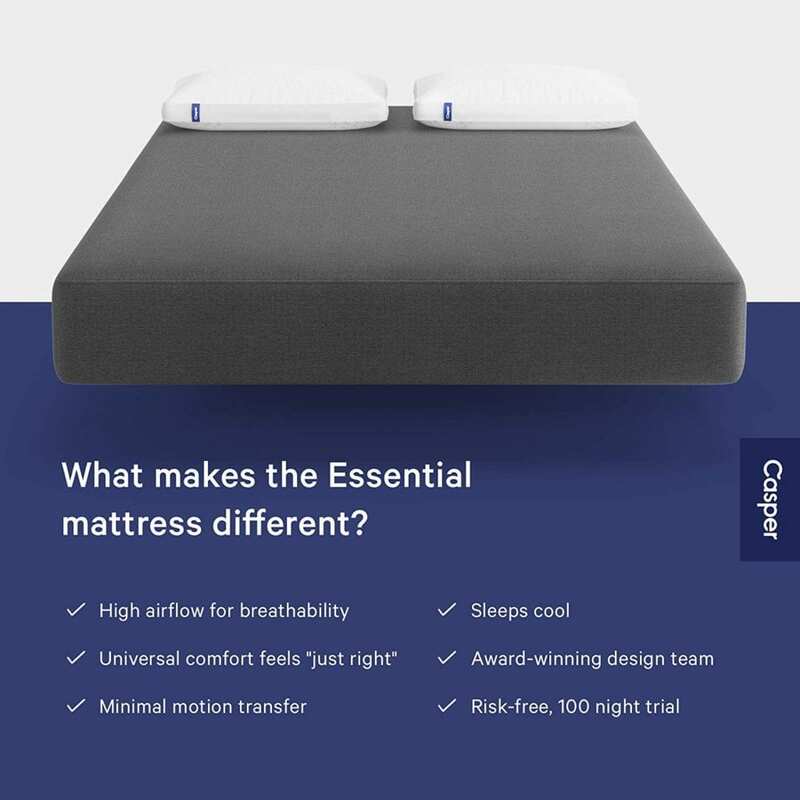 Reviews for The Essential mattress by Casper Sleep can be found on four sites: Casper.com, Target, GoodBed, and Amazon, with Casper having the most and GoodBed the least. The 1,736 customer reviews of The Essential on Casper.com have an average rating of 4.64 of 5 stars (92.88%). This is higher than the 4.42 (88.45%) for The Casper and the 4.46 (89.28%) for The Wave. The Essential is now on Amazon. So far, it has 138 total reviews, but only 40 of these are Verified Customer Ratings (VCRs). The two sets of ratings are very close: 4.25 Stars (85.00%) VCRs and 4.26 (85.22%) All Reviews. The SLTD overall grades for the three models are B- for The Casper and The Wave, and C+ for The Essential mattress, which also matches the customer satisfaction rate for each mattress. On a 5-star scale, The Essential mattress rating would be right in the middle, about 3.2 Stars, but there is no straightforward conversion table listed. There are 1,438 reviews of The Essential on Target.com. However, only a few of them are Target’s verified customers. Almost all the rest, but for a handful, are from The Casper website. Those not from Casper are overwhelmingly positive: this small percentage of reviews was able to raise the overall average rating on Target to 4.73 stars (94.67%). For a weighted aggregate rating, we can only use reviews from Amazon and the Casper Sleep website. Sleep Like The Dead and GoodBed evaluations for this mattress cannot be accurately inserted into the formula, and the ratings on Target too greatly overlap those on Casper Sleep. The aggregate average rating is 4.62 Stars (92.32%). However, we can only use the Amazon ratings in our final determination. When mentioned by reviewers, Casper’s customer service is commended, even in 1-star and 2-star reviews. Several customers like the fact that The Essential is firmer than the other two Casper Sleep models. At the same time, some complain that it is too firm. Besides being firm, many customers say they like the top layer softness, but some say it is too soft. Some said it hurts their backs, and others say it is too thin for adequate support. This could be because the base layer is only 5½” thick. These did not say what foundation they use, but foam mattresses need consistent support underneath and a bed frame adequate for the size and weight of the foundation, mattress, and sleepers combined. One reviewer pointed out that he had to call and ask which side is up, because the instructions were not clear, and that it will be uncomfortable if used upside down. From the product images on Target, the orientation is far from obvious. This indicates one possible cause of customer dissatisfaction with the support and feel. With the firmest foam on top, the mattress will naturally feel too firm. With the softer foam on the bottom, the firm foam will eventually give way and bend in the middle, a hammock effect.